In the well-known science fiction novel Hitchhiker’s Guide to the Galaxy, the Earth is blown apart to make way for a space freeway. When the space demolition team notified the earthlings of their upcoming doom, they use an advanced sound amplifying technology that turned every flat surface on earth into a sounding board, allowing them to broadcast to every human simultaneously. Often, our actual technology catches up quickly with our science fiction technology. This sound reproduction technology first published by Douglas Adams is the latest scifi dream become reality. 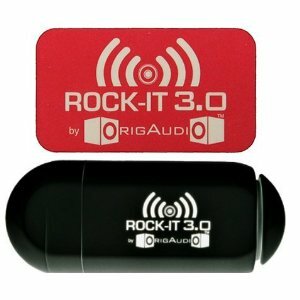 This is the OrigAudio Universal Vibration Speaker. It claims to “turn ANY object into a speaker.” Here’s Five Gallon Correspondent Jeremy Cook testing it out on a 5 gallon bucket. You can see more of Jeremy’s OrigAudio tests on his website, which is dedicated to dedicated to unique DIY and robotics projects. 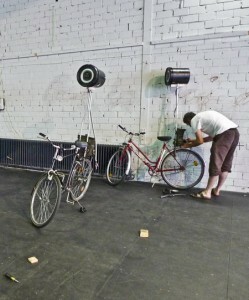 For a less space-age way to use a bucket as a speaker system, check out these bicycle based bucket broadcasters. These were put together for a “sound swarm” which uses bicycles to blast music, propaganda, or wildlife noises throughout a city. And finally, the most archaic way to make a bucket amplifier is by yelling straight into it. Even kids can figure that one out.